How corporates can use Virtual Worlds for professional education & training ? Confronting ideas and working on website ergonomy, I suddenly realized the gap which existed between "talking about virtuality" and "living the virtuality". Maybe, as I developed it in an early post about immersive internet, it is still the use of the word "virtual" that is still frightening people and corporates, maybe it is the close proximity with video games, forcing some to add "serious" to limit the analogy... Maybe also, corporates just do not understand the substantive savings and the qualitative added value they can get from adopting those new collaborative practises. 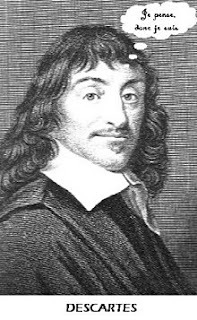 The famous "Cogito, ergo sum" from our national René Descartes, persists in the dematerialized reality as it in the physical one... I am a thing who thinks, or let's say a thinking reality... And I am tempted to go further here, asserting that without his social attributes, manking gives itself a larger freedom of being, behavioring, and exchange knowledge with more authenticity. The last conference I gave could have been made totally into a virtual environment. A training of 3 hours a day during a week, at the MakeMyWorlds Training Center would have cost less than half of the price of the budget that was used to invite me there - which was a pleasure nevertheless - But in those times of economic crisis, swine flue & green logic, that is a real point to think about each time you would organise an event. Salaries of 6 persons during 12h30 which is very different since collaborators are just non operationnal a third of the day interrupting another way with the daily flow. The other important thing is that the 5 sessions can be organised twice a week so the pedagogical process is much deeper and efficient. Above the knowledge those people acquired in the training, you must add some special value directly created from the experience in virtual environments. A group of 6 persons meeting in 5 sessions, develops special bonds sharing a learning experience in an unknow territory ... to make it short and create a physical sensation, it is a bit like those team building sessions where you stimulate a selling force by walking bare foot on hot coals ... just less traumatising and dangerous !! So the budget for this training would have cost to this company , less than 50% of its price in reality, and would surely have brought at least the same effect, and eventually more in a longtime run... since those 6 people would also have developed a special skill to meet in virtual environments ... skill that they could use in the future for internal meetings from home or external meetings out of the city. 0 Response to "How corporates can use Virtual Worlds for professional education & training ?"